Movie Madness Mondays “A Leauge of Their Own” | This is a blog. I love to laugh out loud and cry out loud while absorbed in a good classic “chick flick”. 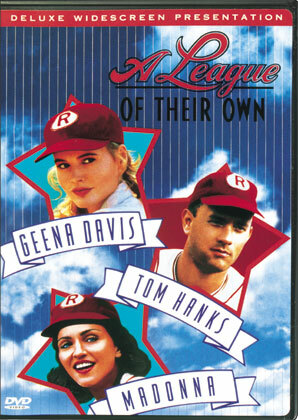 I always find my self lost in the humor and warm sentimentality every time I watch, “A League of Their Own”. I bubble with giggles and tingles as I watch these women embrace, their individual struggles, talents and band together to play one of the most beloved sports in history…baseball. Ahhh baseball, one must break down the barriers of fear, embrace themselves whole hearted with honesty and honor. The one thing I love most about this movie is how these women play baseball, not like men, but like women. Who say’s “there is no crying in Baseball” hahahaha! I love that line! But really…I am inspired by each character as their essence shines through and they accept and support one another through and through. Geena Davis is a graceful leader and a wonderful example of one that embodies, strength and courage, while her sister played by, Lori Petty is a scrappy little thing, struggling, and searching to come to terms with her own individuality, something we can all relate to I am sure ☺ This relationship is how I often feel in my life, at times a graceful leader and at times a fearful scrappy gal trying to find herself. Humor drips from Rosie O’ Donnell and sassy counter part Madonna throughout the movie. The on going banter between these two really cracks me up. Not to mention the constant smile on my face that makes my checks hurt as Tom Hanks tries to salvage the one last chance he has to play a part in the game from the depths of the bottle. Yet, he too can’t help but be intoxicated with this team’s dedication and passion for baseball. Soon the team’s popularity grows, the fans see past the short skirts and embrace the women’s talents and baseball, for the love of baseball. ‘Go Peaches!” Anyhow I gush and gush I love this movie, can you tell? This entry was posted on July 28, 2008 at 2:27 pm and is filed under Movie Madness Mondays. You can follow any responses to this entry through the RSS 2.0 feed. You can leave a response, or trackback from your own site. You know you love a movie when you can quote the entire first half hour. This has to be my favorite movie of all time. The responsible “Queen of Diamonds” Dottie. And the character that makes me laugh the hardest… Marla Hooch. What a hitter. I was a year old when it came out, but I grew up watching it. I love this movie beyond words. Funny, sad, inspiring, and nothing makes me want to pick up my glove and lace up my cleats more! Oppsie, heres the link to hear the entire song… sang by the “Rockford Peaches” ofcourse. Be sure to turn off your pop-up-bloker to listen to the song. I really like this movie simply because it shows we are just as capable as men at doing things. (DUH!) An amazing cast is involved which just lights up the screen. The story is very powerful as well, women having to step in when times are rough (sure it was for entertainment, but hey! Girls are ruling that field!) haha “There’s no crying in baseball!” Classic line. Tom Hanks and Geena Davis do spectacular jobs, as do all. I like how they are in the Hall of Fame thinking of theri good memories on the road, they made history! even if it was short-lived (and also twisted into Hollywood’s own touch) but that doesn’t take the magic out of it one bit! just for the fact that they lost 😛 but I can see where u could get ur point too. Never thought of it that way I suppose. @ Binks I had afeeling about nedra doing this review too! This movie was just on a couple of nights ago!! I really like the fact that you highlighted how girly this team is on the Baseball field, crying and screaming, just being themselves.. nice review! @Skakahoo, I think it’s often the case that women have a different kind of competitive streak when it comes to team sports, maybe? Well that could also be a sweeping generalisation.. but maybe Geena Davis lost her competitive streak towards the end?! Yippie!! Memoirs of a Geisha.. 🙂 Can’t wait! I saw Memoirs of a Geisha in cinema. Need to see it again. ” Sisterhood of the travelling Pants” is on the movie madness Monday selection list? I think thats a great movie to watch. I LOVE this movie! I can’t even pick out a favorite part in the movie because it’s all so good. It makes you laugh, cry, nostalgic, etc. The music is wonderful as well. I love the part where Tom Hanks’ character throws the baseball glove at the kid, lol! And the finishing school they went to to learn how to be ladies was hilarious with Madonna and her whole persona. It’s just such a classic movie that I can watch over and over again. I like this little movie…..don’t love it. I think Penny Marshall chose well; something new like an all girl baseball team. I just don’t like Rosie O’Donnell….actually the only thing I like about her is her absence. I love this film! Seeing Geena Davis, Lori Petty, Rosie O’Donnell and Madonna in one film is fantastic. Having it directed by Penny Marshall makes it all the better. Little did I know as a child that a professional women’s baseball league even existed.That just goes to prove what little recognition these ladies have gotten over the years. They’re women who were brought together because they all had the guts, determination and talent to change the face of American sports, that can be interpreted as women can really change anything they want!! P.S: Just felt like writing a little bit more about it! A League of their Own is my all time favorite baseball movie. It is such an amazing story and it gets me laughing on the floor every time!